Before I visited Belfast & Derry, Northern Ireland in 1983, then under British military occupation, I had never known such a terrifying spectacle. Taxis wouldn’t drive into the Catholic neighborhoods & there were no buses anymore; everyone going into the shopping district went through military checkpoints where belongings & bodies were searched; currency exchanges, hotels, & other businesses were surrounded by tiers of barbed wire & armed soldiers. But worst of all, there were constant caravans of armored vehicles. Some would stop & egest soldiers aiming rifles; some had soldiers with rifles mounted on turrets pointed directly at pedestrians, including women with baby strollers & small children walking to school. On one occasion, I pointed my camera at a soldier aiming at a woman & child & he pointed his rifle at me until I put the camera down. A group of small boys agreed to guide me in Belfast to show me the murals done in tribute to the hunger strikers. Periodically they would stop to hurl stones at passing caravans of British troops. It scared the hell out of me & I observed the boyish insouciance of the pelters was only apparent; the boys were as scared as they were defiant. This photo of an Israeli soldier in the West Bank village of Tafoh (near Hebron) during Israel’s jackboot occupation (June 15th) is worth one of Netanyahu’s ten thousand lies. Pro-Zionist media can spin the narrative anyway they like but pointing a rifle with live ammunition at unarmed women & children is no part of hostage negotiations with kidnappers. It is a brutal military occupation. The faces of these young boys testify to Israeli terrorism; the mothers are afraid to look at the soldier lest they provoke him. 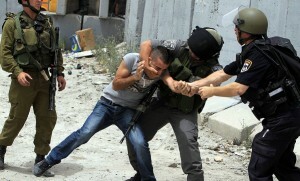 Look at this photo & try to claim Israel is only trying to get the three boys back by terrorizing Palestinians. 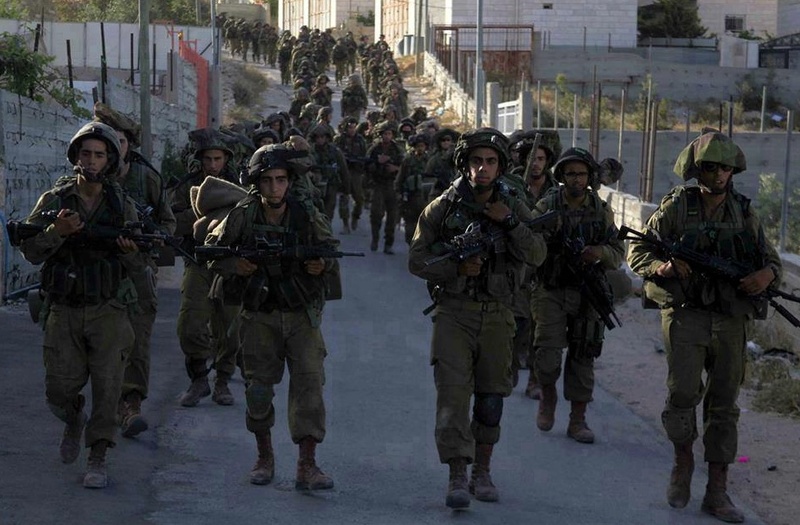 The Israeli military has named its jackboot operation in the West Bank “Operation Brother’s Keeper” in sync with the poetic names for all their ethnic cleansing operations in Gaza. It has a catchy lilt, but you don’t have to be a conspiracy theorist to see that something isn’t adding up in the abduction story. Even the UN issued vague misgivings saying ‘there is no concrete evidence the boys were actually abducted by Hamas terrorists’. For a long while now, Israel has been recklessly accelerating illegal settlement projects throughout the West Bank, expropriating lands, forcibly removing thousands of Palestinian residents, using excessive, lethal violence against protesters armed only with rocks. It was so egregious & apt to negatively affect the international image of Israel that the US State Department issued little peeps of protest. It cannot be said Palestinians have the character of leadership they deserve with the political program necessary to lead intifada to a democratic secular state including Palestinians & Jews. That is a critical problem for Palestinians to resolve. The question of their leadership, however, is of the greatest consequence to Israel & the US & they employ every treachery in the book to fracture unity between contending political forces in Palestine & to favor those most willing to betray intifada. The recent (April) power-sharing agreement between Fatah & Hamas, the two most prominent Palestinan groups, was greeted with due skepticism, if not outright incredulity. The fault line of that so-called unity agreement is exposed only weeks after it was signed by Israel’s clumsy use of a divide & conquer strategy where they blame Hamas for the abductions & Mahmoud Abbas, the head of Fatah, walks right into the trap, berating Palestinians from a podium in Saudi Arabia for the kidnappings & pledging to work with the Israeli army to rout the culprits. 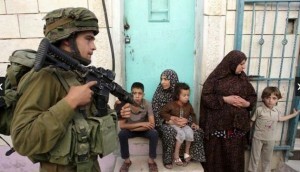 Which of course means cooperating with Israel in it’s jackboot occupation of the West Bank. What about the Palestinian hunger strikers in Israel’s gulag, Mr. Abbas? Can you take even a moment to express solidarity with them, including the 220 children? What is adding up in the story is the complete political bankruptcy of Mahmoud Abbas who is not even the elected leader in the West Bank but just keeps reappointing himself to serve as Israel’s handmaiden. In many ways, he’s only ever been the titular head of Palestinians, preferring to serve the interests of Israel & the US. An article in Haaretz, the Israeli newspaper, points to an extremely alarming development within Israel accompanying the acceleration of ethnic cleansing in Gaza & the West Bank. That is the crackdown on the right of dissent & the freedom for Israelis to oppose Israeli apartheid. The writer pointed to legislation (like the Naqba law banning support for BDS), attempts to curb public protests, attempts to curtail funding to dissident groups, & crackdowns on human rights groups, labeling them traitors & “fellow travelers with terror”–all tactics straight out of the McCarthy-era handbook. There are important dissident groups within Israel, many who have for decades stood against Israeli ethnic cleansing, & defense of Palestinian rights includes active solidarity with those organizations against the crackdown on democracy within Israel. Photo (from June 16th) is Israeli soldiers blindfolding a Palestinian “suspected of throwing stones” in Hebron, West Bank. The young man will likely end up in Israel’s gulag. 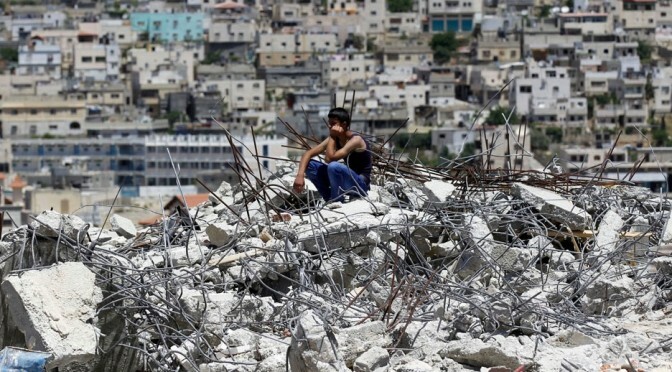 In addition to Israeli bombing forays in Gaza, this is the scene in Hebron in the West Bank. Israel is using the abduction of the three boys to terrorize Palestinians. Boycotting Israeli goods, supporting the cultural boycott of Israel, and demanding “No military aid to Israel” has never been more important.